Below is a brief overview of the Takamine Pro Series 2 acoustic guitars. I will cover the Pro Series 2 guitars and highlight the differences and similarities between them. 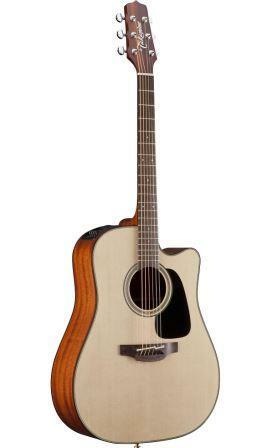 This is the second of Takamine’s pro series, series. There is something very unique about Takamine’s Pro Series 2 – and that is that there is only one guitar in the series! So, this is going go be a very short overview, but there you have it. As mentioned above, this is the only guitar in this series. As with all Takamine guitars the P2DC features a pinless bridge – making string changing super easy – and a split saddle bridge. The biggest difference that this will make is that the Cedar topped P1DC will have a warmer more mellow tone whereas the P1DC, with it’s Spruce top, will have a brighter, more dynamic tone. The P2DC is slightly more expensive than the P1DC but only by a very small amount. So, if you were trying to decide between the P1DC and the P2DC, the decision would basically come down to the sound that you preferred the most. The Pro Series 1 series has 6 different guitars, so there is definitely a bit more variety there – there are different shape options, cutaway and non-cutaway options and there’s a 12 string version too. The Pro Series 3 has 9 different options – so there’ll be more to talk about when I get onto that one! So this has been a very brief outline of the brief Pro Series 2 guitars (or should I say guitar!) by Takamine. Next up, I’ll check out the Pro Series 3 guitars, where there will be a good bit more to talk about.